It is really unthinkable to imagine some dishes, such a grilled meat, without chutney. Premium quality and fantastic taste is what you can get from this product. Only the top quality aubergines and peppers have found their place in Podravka chutney. Prepared according to the best domestic recipe, without preservatives and artificial aroma. 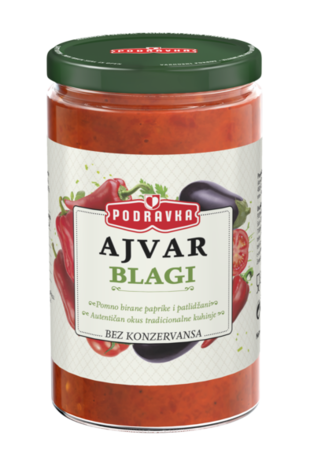 Ajvar can be used in the original form, as a relish to complement barbecued dishes, sandwiches, frankfurters, sausages, or as an additional ingredient in your sauces, stews, soups, etc. Storage: Refrigerate after opening and use within 10 days. Keep away from direct sunlight.